Masala pal is very famous in South Indian restaurants. And trying it at home is quite easy. Kids will love this flavorful milk and is nutritious as its loaded with the benefits of nuts. This healthy beverage is a unique blend of soaked nuts with milk, mild spices along with saffron. 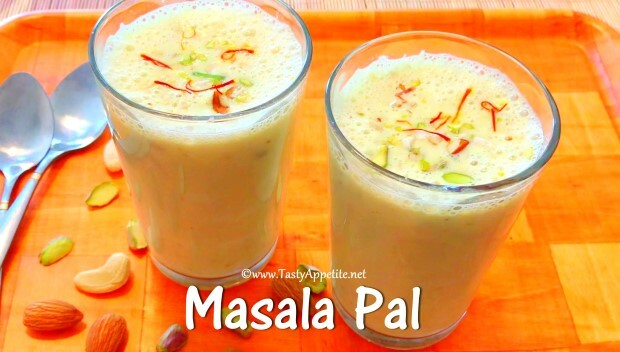 Do check out this easy video recipe to make masala milk your family favorite too. Take 1/2 cup of milk in a small bowl. Add cashew, badam (peeled), pistachios in the bowl. Allow to soak for 10 to 15 mins. In a small cup, take 2 tbsp of milk. Add few saffron strans and allow to soak. Now add 2 & 1/2 cups of whole thick milk to pan. Once the milk starts boiling, add cinnamon, cloves and cardamom. Stir well and boil in low flame for 10 mins or until milk reduces to half of its volume. Meanwhile add the soaked nuts to blender. Add few little milk and grind to fine smooth paste. Once the milk is thickened well, remove the cardamom, cinnamon and cloves. Stir the milk and add the saffron soaked milk. Add the nuts paste from the blender. Add turmeric pwd, raw sugar, cardaom pwd and stir. Once the milk starts boiling, stir and turn off flame. Healthy flavorful delicious homemade masala pal is ready.